Today I am here with Sweet Ragi Kuzhi Paniyaram. 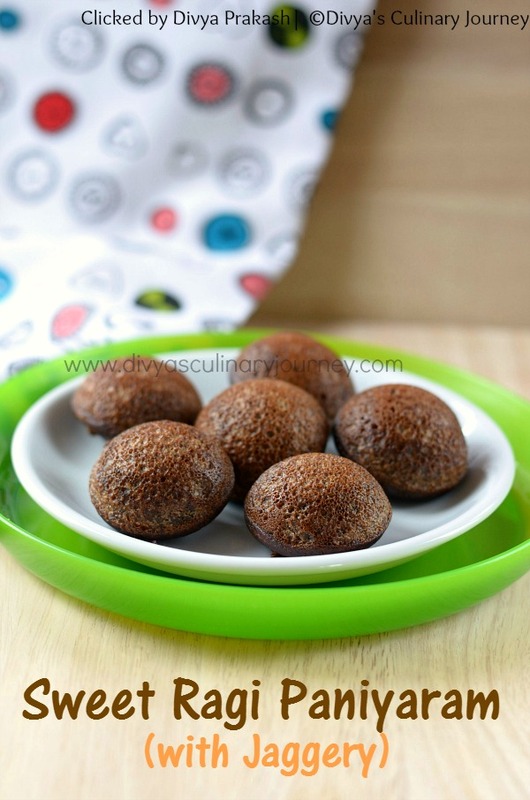 This is an instant paniyaram made with Ragi flour and jaggery. Ragi is called as Finger millet in English, Kezhvaragu (கேழ்வரகு) in tamil and Nachni in Hindi. Ragi is rich in calcium, iron, has high fibre content. It is also a great baby food. I try to use it in as many dishes as possible. For sweetness I have used Jaggery, which is a healthier substitute for sugar. It is rich in iron, and it is loaded with anti-oxidants and minerals. This is easy to make, healthy and tastes delicious. I made this paniyaram for my kids for breakfast and they loved it. 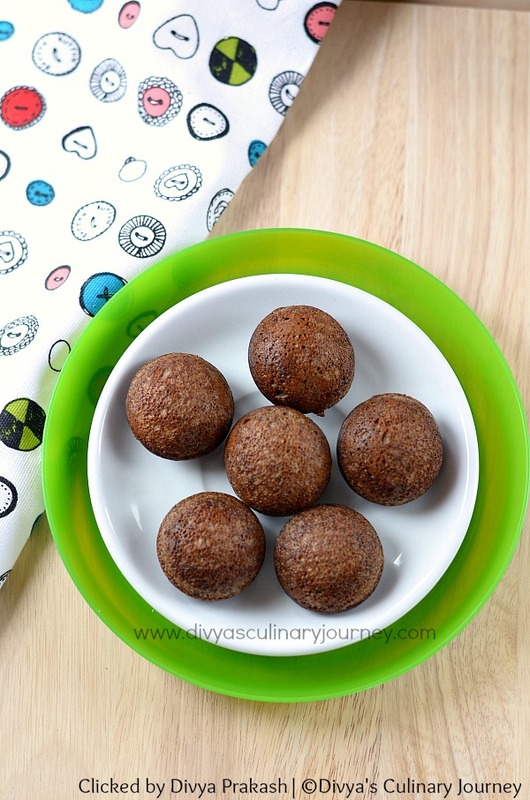 If you want to feed something healthy and also the one kids will love, then you can give this paniyaram a try. 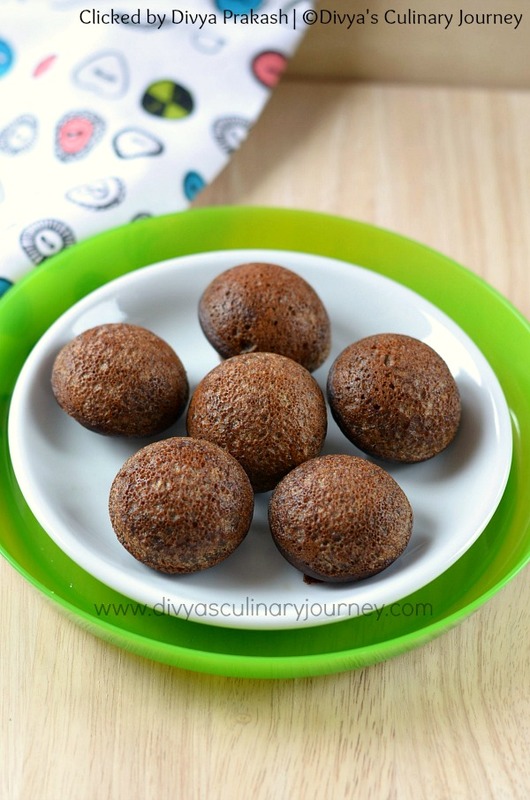 This is a South Indian style paniyaram (aebleskivers) made in appe pan using finger millet (ragi) flour and jaggery. It is quick to make, delicious and is healthy. This paniyaram can be had for breakfast and also snacks. Green Cardamom : 5 nos. In a pan, add jaggery and 1/2 cup of water and heat it. Let it melt, then turn off the heat. Filter any impurities and let it cool slightly. Peel cardamom skin and remove the seeds.In a blender add those seeds along with tablespoon of sugar and grind it into a fine powder. In a bowl, add ragi flour, along with salt and baking powder and mix well. Then add the melted jaggery, powdered cardamom and milk and mix well such that the batter is smooth without any lumps. Heat the paniyaram pan, add little oil to each paniyaram cup, then pour the prepared batter such that it is about 85% full. Cook for 2-3 minutes till it is golden. Then turn it to other side, apply oil if required then cook for another 2-3 minutes. Remove from heat. Repeat the process for rest of the batter. While cooking paniyaram, heat should be in medium- low. If it is high, the paniyaram will burn outside while it is still uncooked on the inside. You can also add 1/4 cup of fresh grated coconut for variation. If you are not keen on the vegan version, then instead of oil, you can add ghee for more flavor. This batter serves about 4 persons, for 2 persons, you can reduce the quantity to half. Yummmy yummy. Looks too good.